It's been time to clean out my purse for a long time. A really long time. I've done several half-inventories, quickly, right before heading out the door and only to make room for whatever I needed to fit. So I decided to do a complete inventory of my purse, uncensored, for your entertainment. The purse, before. Snapped closed. Neat and unassuming. A tad bulky. 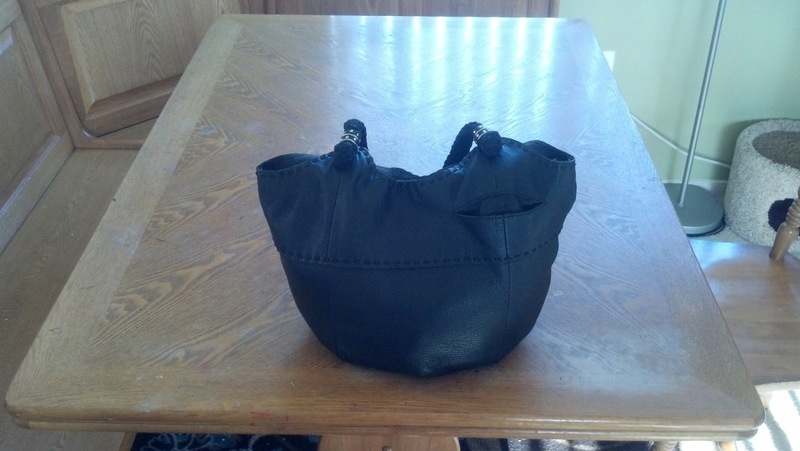 The purse, after. Emptied of it's cargo. A tad shocking. What IS all that, you might be wondering. I took notes. 2 mini composition books filled with my random thoughts and ideas. 1 bag Traditional Medicinal Organic Eater's Digest tea. 1 handout from a different church on which was scribbled the URL to a knitting website recommended by a friend. 2 Sugar 'n Cream yarn labels, saved for the dishcloth pattern on the back. 1 Cherry 7-UP Lip Smacker. 1 credit-card-sized dental floss dispenser. 3 small bottles of hand sanitizer. 1 purple plastic counting bear. 1 packet containing 1 cloth and 1 bottle of lens cleaning solution. 1 additional cloth for cleaning glasses. 1 snack sized baggie containing 4 multivitamins and 2 iron pills. 1 travel size dental floss container. 6 State Farm anti-texting-while driving thumb rings. Small ring with 6 laminated Bible verse cards attached. 1 lacy hair clip. (Worn by Elaine in my brother's wedding! It has not been in my purse since then. Paper from our city's sewing center with details on the machine I'd like to buy. Little green rubber bouncy ball. 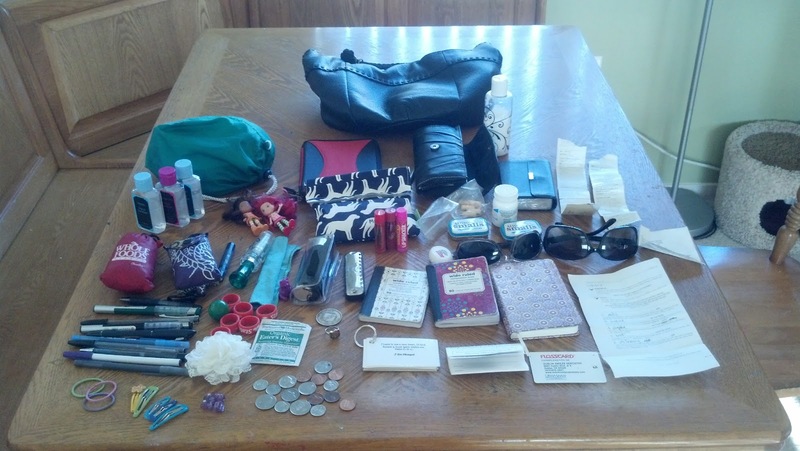 That's 91 items in one purse. What's in your purse? Think you can do wors-uh-better? Bring it on! You have, like, the Tardis of purses. LOL! That might be a reason I don't carry a purse. :) Instead I have a 20lb diaper bag. Complete with coloring books, crayons, toy cars, camera, complete changes of clothes for 3 kids, whistle, hat assortment, tissues, napkins, lotions, hair accessories, nail clippers, first aid kit, water bottles, and a whole lot more.